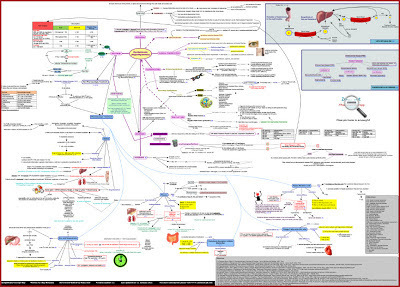 The aim of this map is to cover the pharmacotherapy of dyslipidemia in an easy and an interesting way that will help you understand the topic and link it with the other related cardiovascular diseases as atherosclerosis. Look inside the map and understand it through this video. The concept map of Dyslipidemia (Hyperlipidemia) starts with the definition. Dyslipidemia is a disorder of elevated or abnormal levels of lipids and/or lipoproteins in the blood, characterized by high cholesterol, triglycerides (TGs), or both, or low High-density lipoprotein (HDL) level. From this definition branches out the normal physiology of lipid metabolism including what is meant by lipoproteins, function of lipoproteins, and their classification. Low-density lipoproteins (LDL); carry cholesterol from the liver to cells of the body; it is referred to as the "bad cholesterol" lipoprotein. LDL has a role in initiating the atherosclerosis process; this is how dyslipidemia is a risk factor for atherosclerosis and consequently cardiovascular diseases (a small map for cardiovascular diseases categories is included). The intestine absorbs dietary fat and packages it into chylomicrons, which are transported to peripheral tissues through the blood. The enzyme lipoprotein lipase breaks down chylomicrons; and fatty acids enter muscle and adipose tissues. The chylomicron remnants are subsequently taken up by the liver to start the process of very-low-density lipoproteins (VLDLs) synthesis. The liver secretes VLDL, which undergo lipolysis by lipoprotein lipase to form LDLs. LDLs are then taken up by the liver and by the peripheral tissues. HDL is produced by the liver. Its function is to transport cholesterol from the body back to the liver. That is why it is called “good cholesterol” lipoprotien. Most patients are asymptomatic for many years prior to the appearance of physical findings. tuberous xanthomas in the Achilles tendon, hands, feet, elbows, and/or knees. And symptoms of dyslipidemia can include: paresthesias, dypsnea, and confusion. Watch the video to know when Primary Dyslipidemia is suspected in a patient. - Diseases: diabetes, hypothyrodism, obstructive liver disease/ biliary cirrhosis, renal disease, nephrotic syndrome/ chronic renal failure, or obesity. - Drugs: estrogen, progestins, protease inhibitors, anabolic steroids, corticosteroids, isotretinoin, cyclosporine, atypical antipsychotics, thiazide diuretics, or β-Blockers. These causes should be considered in the diagnosis and the management of dyslipidemia. Details are available in the video above. Diagnosis of dyslipidemia is based on the Fasting Lipid Profile of the patient; accompanied by the assessment of cardiovascular risk factors using Framingham Risk Score for patients with ≥2 risk factors. 1- CHD and CHD Risk Equivalents. 2- For patients with ≥2 risk factors, perform Framingham 10-year CHD risk assessment. 3- For patients with ≤1 risk factor, 10-year risk assessment is not required. These risk categories are linked to (treatment goals) part in the map. This part of the map starts with dyslipidemia treatment goals (classified according to the risk category) and targets (primary target for therapy is LDL). Therapeutic Lifestyle Changes (TLC) and dietary recommendations are stated under the part of non-pharmacological treatment of dyslipidemia. 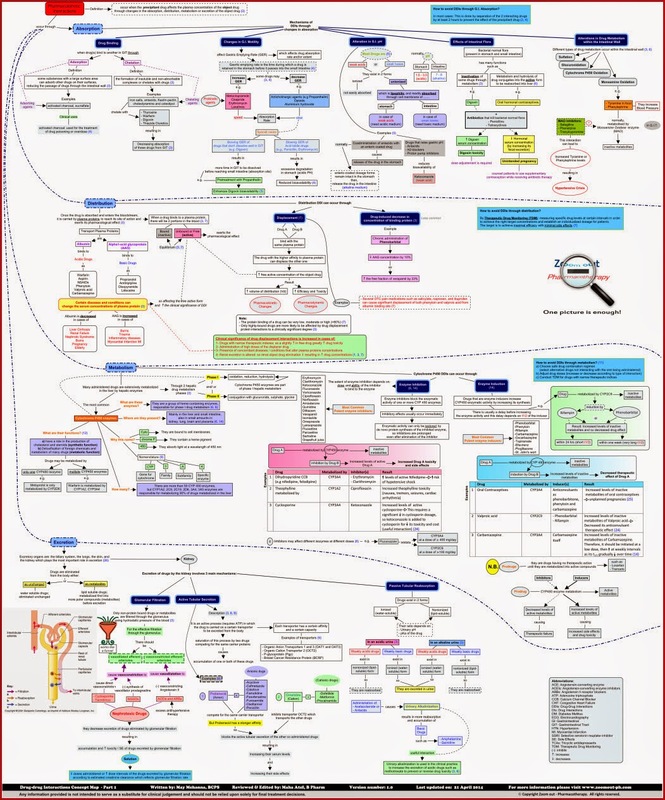 Each drug / drug class has its own map that covers: the mechanism of action, indications, adverse effects, drug interactions, contraindications, and precautions if any. The map also shows you how to manage certain adverse effects and drug interactions for these drugs. See the following example for Bile acid sequestrants.